1 A major trend in Russia from the 1890s to the late 20th century was the movement of people from the European portion into Siberia and the Far East, the latter regions occupying three-fourths of the nation's territory but containing only about one-fifth of its population. 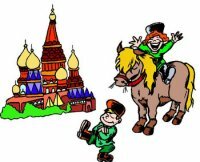 2 Even though there are many big cities in Russia, the majority of the population lives in smaller towns and villages. These are considered to be provincial places, as opposed to major urban territories, like Moscow, St. Petersburg, Novosibirsk, Omsk, and others. 3 Many of those in smaller towns and villages usually live in the private houses and own some land around the house where they grow fruits and vegetables. Many of those houses, called "izba," are built of wood, and have enclosed stoves in them for heating and cooking.